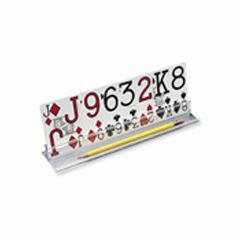 People with pain and/or limited use of their hands will find using the Playing Card Holder much easier than trying to hold multiple cards in one hand. The slot is designed so that cards can be easily added or removed. Also holds Mah-Jongg tiles, recipes or memos. Pencils and small coins fit on the extended front of the holder. The clear plastic provides greater visibility. Measures 2" deep x 1-3/8" high and is available 10" or 15" long. Packaged 1 Each; Playing cards shown NOT included. Works perfectly and simplifies my life ! Sturdy. Lightweight. Easy Storage. Holds lots of cards. I play lots of cards and have nerve damage in one hand. Someone recommended a card holder, but I didn't think it looked good. This one is small enough to be unobtrusive and it sure makes those long games easier to handle. I give it an enthusiastic thumbs up ! ALL OF THE LADIES I PLAY CARDS WITH USE THIS! IT IS JUST MORE CONVENIENT THAN HOLDING CARDS! Item is simply a piece of molded plastic with a channel to rest the cards in. It works well for the intended purpose however, like most all items for the physically challenged, it is very overpriced. Easy to use. Lightweight. Sturdy. The card holder makes it possible for me to play cards with my family. This is a past time that we have done for years, but recently with damage to the joints in my hands I haven't been able to do. Great product. Sturdy. Easy Storage. Lightweight. Safe. This product does hold playing cards as it was designed to do, but more importantly it adds to enjoyment of life during very difficult times. how many cards will it hold I play canasta with my grandson and 15 cards is a lot! I use mine for playing cribbage and it easily holds 6 cards with none overlapping.